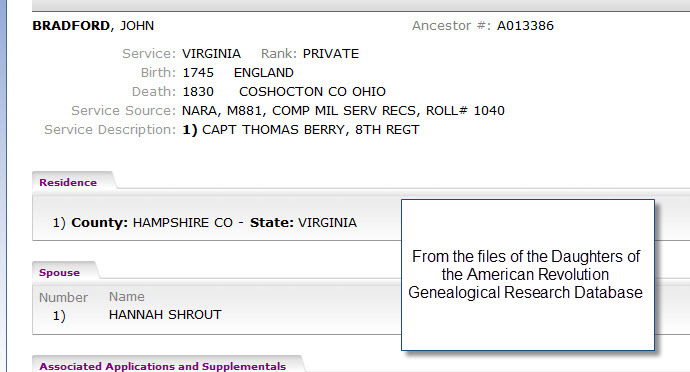 The Bradford man from whom I am descended came to the United States in the mid-1770s. He is thought to have been born around 1745 in the area of Yorkshire, England. What forces drove him to leave his family and what resources permitted his passage are subjects of conjecture. His military service to his adopted country is not. This man is my Bradford Immigrant. By collating Federal Census data, an Ancestral Register Report by Doug Kreis and a family history shared by Ray Jackson I can connect my grandmother, Kerma Pauline Bradford Minor, to this English-American, John Bradford, Senior. Felt so hopeless looking for anserws to my questions…until now. So glad my post could be of help! !